Receiving a Fulbright grant is a very large honor that comes with responsibilities, one of which is promoting mutual understanding. I received a Foreign Language Teaching Assistantship (FLTA) grant, which means I was a Portuguese language teaching assistant at the University of Georgia from July 2012 to May 2013. Brazilians are all over the world (you might have seen one already!) and we love to share our culture with others. Can you imagine how exciting it was to be able to do that as part of your job? From discussing small things such as eating pizza with silverware, to talking about Carnaval, or even the dark days of Brazil’s dictatorship, my Fulbright FLTA grant required a great deal of research for me to effectively share what being a Brazilian is all about. Believe it or not, I actually learned more about my country and myself by doing so! I didn’t want to just teach my students Portuguese, I wanted more; and that’s why I took every opportunity to “show” Brazil to them and to members of my host community. 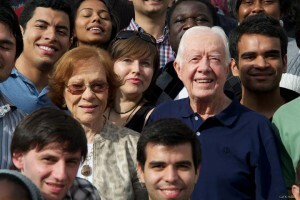 During an event organized by the Georgia chapter of the Fulbright Association (where I had a chance to meet former President Jimmy Carter and First Lady Rosalynn Carter! ), I was invited to give an impromptu talk about my country. I did not hesitate to participate, and along with another Brazilian Fulbright FLTA, collaborated to give a presentation about Brazil! 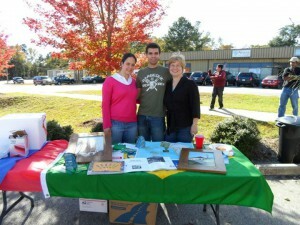 In Athens, Georgia, both the University of Georgia and the local public administration organized cultural events such as the International Street Festival, and the Latin American Festival, where I managed the Brazil table. During the mid-year Fulbright FLTA Conference in Washington, DC, when Fulbright FLTAs were asked to submit ideas for session topics, I proposed sharing some new Brazilian language instruction technologies and projects from which other Fulbright FLTAs might benefit. My presentation was about Teletandem Brasil, a Brazilian project in which foreign language students from different countries help each other through Skype. Since my Fulbright year, I’ve had a great deal to share back at home. A week after I returned to Brazil, I was invited by my alma mater, the Federal University of São Carlos, to share my experiences and perceptions of the United States with current students, and to encourage them to think about applying to the Fulbright FLTA Program. I’ve also visited some public schools in Brazil and given short presentations to low-income teenage students about aspects of American life and how study abroad can enhance one’s education. From meeting former President Jimmy Carter to teaching Portuguese in Georgia, I have had much to share about my time in the United States. Sharing is part of what it means to be a Fulbright FLTA, but on a personal level, it also means that I am spreading my enthusiasm for learning about different languages and cultures as much as possible. I am one of the Fulbright program 2012/2013 grantee. I think we had chance to meet and talk during the DC mid-year conference. I just say it was a superb experience to be a fulbrighter. Keep the good spirit.